The timeline shows the current monthly inflation rate in Germany from March 2018 to March 2019. 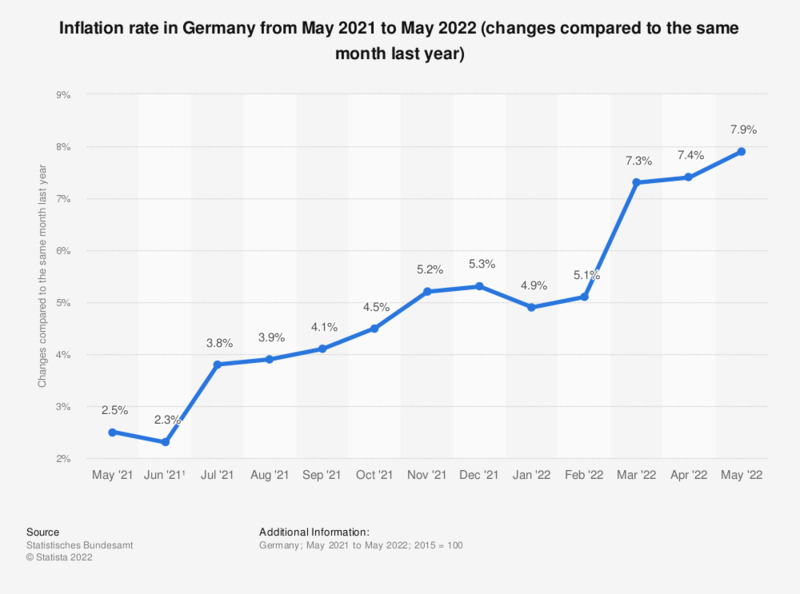 In March 2019, the consumer prices in Germany increased by 1.3 percent compared to the same month of the previous year, based on preliminary figures. The inflation rate is calculated using the price increase of a product basket defined by the German Federal Statistical Office. This product basket contains services and products, on which the average consumer spends money throughout the year. This includes expenses for groceries, clothes, rent, power, telecommunications, recreational activities and raw materials (i.e. gas, oil), as well as federal fees and taxes. The term inflation means the devaluation of money caused by the increase of the price level of products (consumer goods, investment goods). The Consumer Price Index shows the price trends for private consumption expenses and shows the current level of the inflation when increasing. Figures for months up until February 2018 were taken from data published by the German Federal Statistical Office. The inflation rate depicts the increase of the consumer price index (Baseline: Index 2015 = 100).